Brink developer to release mobile turn-based strategy title. 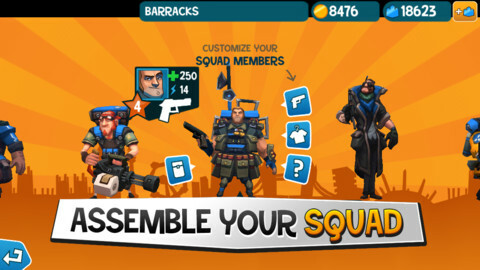 Splash Damage announces RAD Soldiers for iOS devices. Brink developer Splash Damage has announced a new game for iOS devices this morning entitled RAD Soldiers. 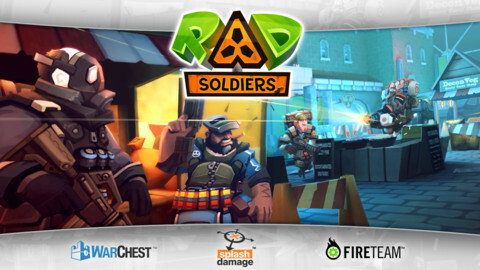 Published by WarChest, RAD Soldiers is a turn-based multiplayer strategy title set in the blasted ruins of an evacuated London. There'll be a variety of mercenaries to build your unique squad with, and customization options will be available for each member of your crew. Once kitted out with your chosen weapons, outfits, and abilities, players will take their squad into battle against AI opponents in the offline mode, or against friends online. "Turn-based combat means there's no rush, allowing you to ponder your next move at your leisure and giving you ample time to unleash your inner tactical genius," said Game Director Richard Jolly, CCO of WarChest. "You'll earn valuable experience for your soldiers whenever you play, leveling up your squad commander to unlock new abilities." "You'll also earn coins while you play and use them to unlock brand new soldiers, customization options and equipment in the ever expanding in-game store," said WarChest's CEO Paul Wedgewood. The upcoming title will also feature Game Center and Facebook support. The game will be released in June this year for iPhone, iPad and iPod Touch devices. RAD Soldiers will be free to download, although we don't yet have any information about how exactly the game will be monetized. We'll update as soon as we hear more.